Wampee is believed to be native of Southern China. It is commonly cultivated in Southern China, Vietnam, Cambodia, Indonesia, Laos, Malaysia, the Philippines, Singapore and Thailand. It is occasionally grown in India, Sri Lanka, parts of Australia, USA and Central America. 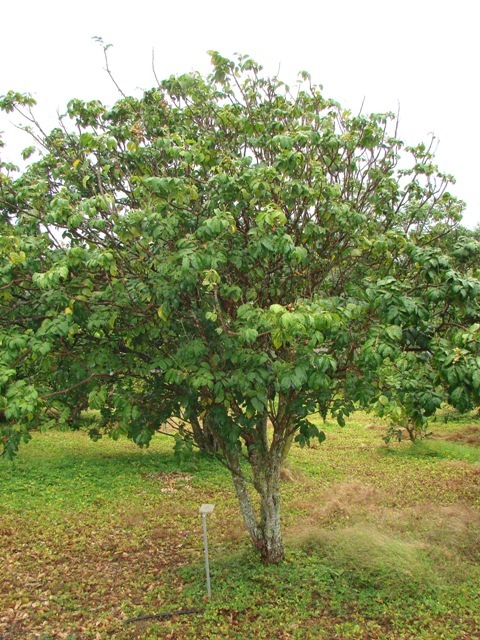 An evergreen tree upto 12 m high, usually low-branched, trunk diameter upto 40 cm. Leaves spirally arranged, up to 40 cm long, petiole1-2 cm, pinnately compound with 3-15 leaflets; leaflets ovate-elliptic, up to 14 cm x 7 cm, terminal leaflet largest, lowest pair smallest, thin coriaceous, glossy dark-green, oblique at the base, margins entire to minutely crenulate, coarsely undulate-subdentate toward apex, glabrescent, petiolules 5-7 mm long. Flowers subsessile, 5-merous, sweet-scented, whitish to yellow-green; sepals less than 1mm long; petals narrowly elliptic, 5mm x 2 mm; stamens 10; ovary on short gynophore, 5-celled, borne on terminal and sub-terminal Inflorescences which are up to 50 cm long and cymose-paniculate. 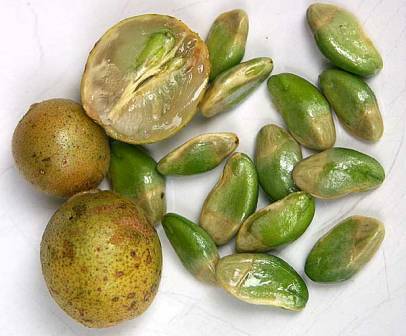 Fruit a subglobose berry, up to 2.5 cm diameter, brownish yellow, sparsely puberulent, 5-celled but often only 1-2-seeded; pericarp thin, glandular dotted; pulp watery, semi-translucent, acid to sweet. Seeds ellipsoid-ovoid, about 1.5 cm long, green with brownish. Ripe fruit is often consumed raw. It has a pleasant flavour. The pulp can be added to desserts or made into pie or jam. Jelly can be made from acid under ripe fruits. In South-East Asia a kind of champagne is made by fermenting the fruit with sugar and straining off the juice. The dried unripe fruits and dried sliced roots are used as a remedy for bronchitis. Ripe fruits are said to have stomachic and cooling effects and to act as a vermifuge. A decoction of the leaves is used as a hair wash to remove dandruff and to preserve the hair wash to remove dandruff and to preserve the hair colour. 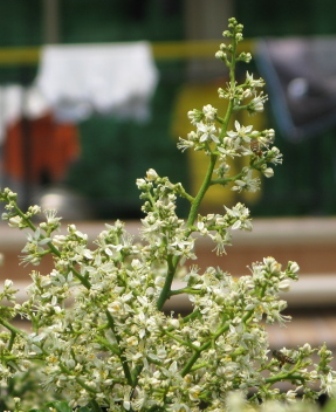 Wampee can be propagated by seed or by cuttings, air layers or grafts on Wampee seedlings. Seeds germinate in a few days. Grafting on other citrus rootstocks has not given good results. Mist propagation of softwood cutting has been successful. .
Pruning is recommended to avoid overcrowding of the branches. Wampee has a tendency to develop chlorosis on limestone soils but it can be corrected with applications of mg, Zn, manure and mulch. 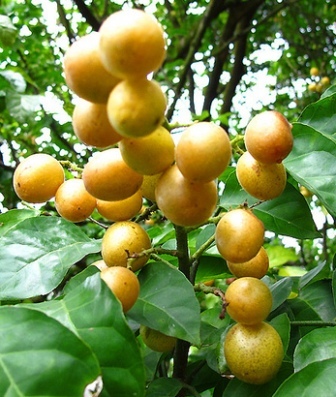 Well-developed mature trees of Wampee can produce up to 45 kg fruits per season. Better fruited selections of wampee have been in almost every wampee growing region and are available at the local nurseries. Germplasm collections of wampee have been made at the Chiayi Experiment Station in Taiwan, Department of Botany of the Chulalongkorn University in Bangkok, Thailand, and the Citrus Research Center and Agricultural Experiment Station of the University of California, USA. Wampee is very easy to grow. Practically, there is no problem of pests and diseases in this fruit. The yield is also fair. Though wampee is known and grown in South-East Asia, but agricultural aspects, the possibilities for canning the fruit and the pharmaceutical properties of the plant need further study.